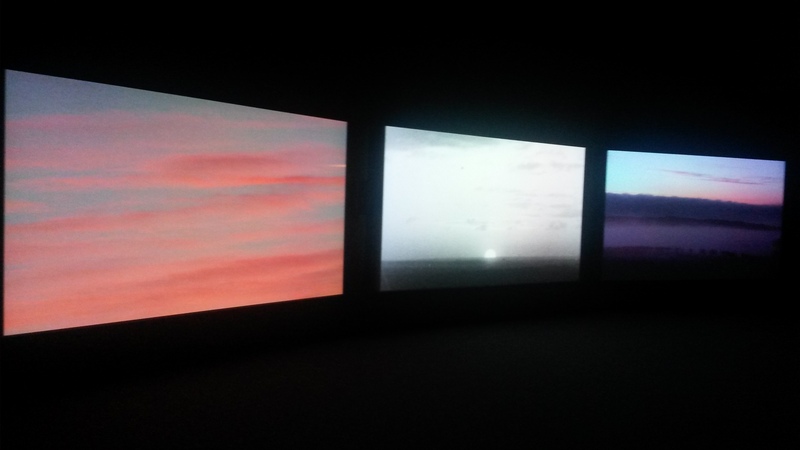 The Unfinished Conversation, the three channel video installation by John Akomfrah, is so dense with ideas and images that I was obliged to make a return trip to The Power Plant and watch it multiple times. Projected in a hushed room, on massive screens, and featuring a sound track that is at least as rich and layered as the visual component, I found every viewing of this artwork a rewarding experience. The cultural theorist Stuart Hall is the ostensible subject of the piece and his personal and professional life is effectively traced within it. 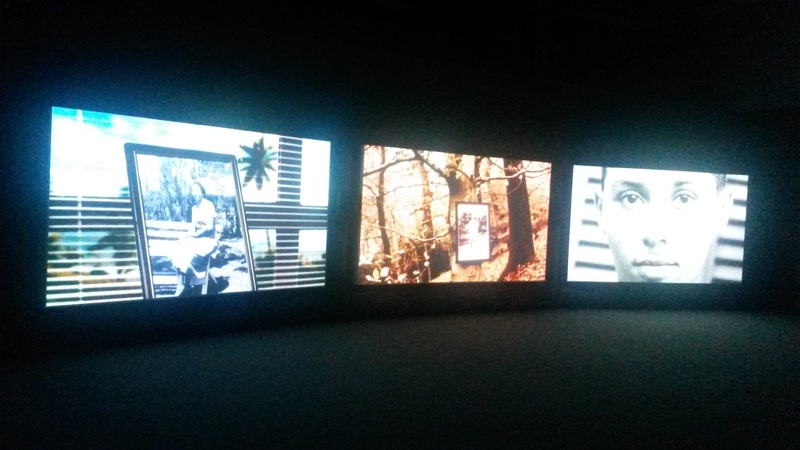 Visually and structurally, Stuart Hall functions as a fulcrum – around which a kaleidoscope of images swirl – illuminating societal and cultural forces at work, first in his home country of Jamaica, and then in Britain in the 50s, 60s and 70s. 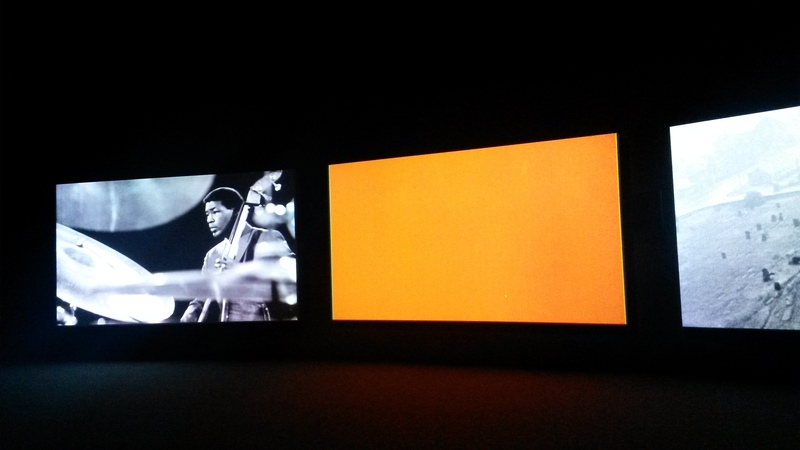 John Akomfrah seemed to have access to the BBC archives as these distant eras are brought to life with so much fascinating material, including TV programming from the time, news footage, photographs and sound recordings. Stuart Hall came to the UK as a Rhodes Scholar in 1951. He produced important academic writings, particularly theories of mass communications and he expanded the idea of cultural studies in the academic world. But he hardly confined his activities to academia. He was also a prolific journalist, television personality, champion of the arts, and is often referred to as the “Godfather of Multi-Culturalism” for his work in these various media on immigration, race and the politics of power. Stuart Hall died in 2014. 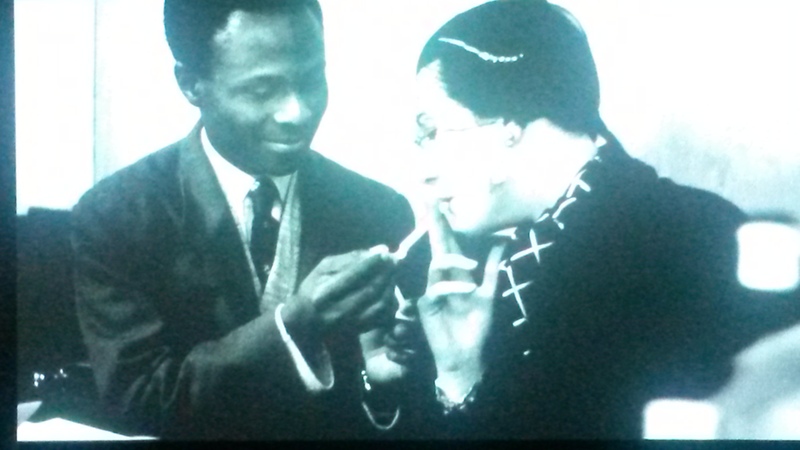 “Identity is an ever unfinished, endless conversation” is a (paraphrased) statement made by Stuart Hall in the video. His own identity was shaped in the intensely race conscious Jamaica in which he felt an outsider even in his own family. He longed to be part of the modern world and for West Indians of that era the UK was an escape and a second “home,” to which, he decided soon after his arrival there, he would never belong. 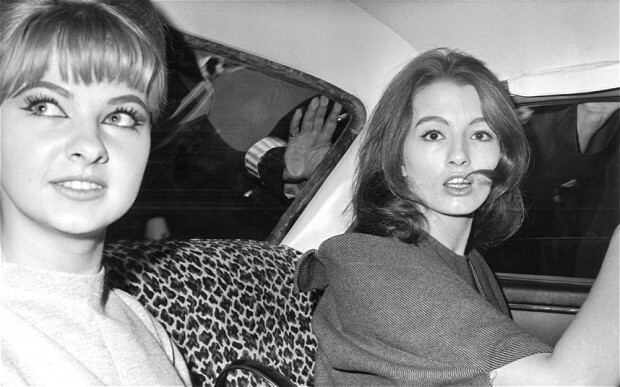 The sixties in the UK were not just about mini skirts, the Beatles and Mandy Rice Davies! 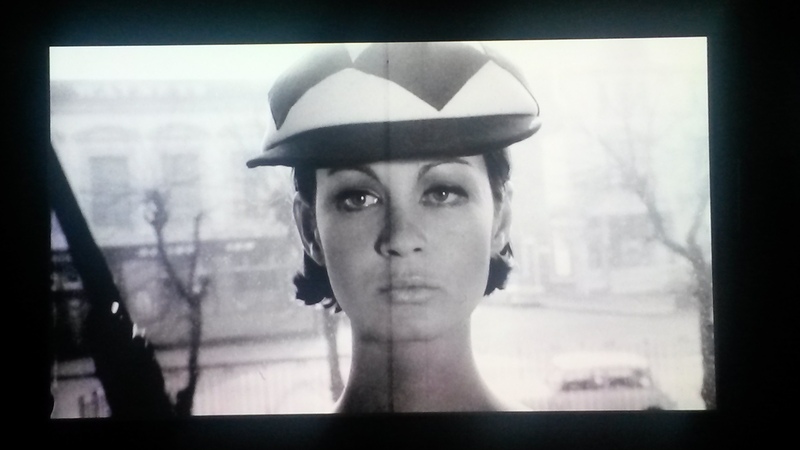 With a focus on the impact of British colonialism around the world a steady drumbeat of upheaval is referenced in the artwork: Conflicts like the Soviet Invasion of Hungary and the Suez Crisis; social movements like the protests by the Campaign for Nuclear Disarmament, natural disasters of every kind, the 1963 Profumo scandal, workers strikes, the beginning of the wars in Asia, mass immigrations, the travails of the poor in Northern England, Civil Rights demonstrations, the rise of consumerism are all depicted in this piece. These events affected and changed the individual known as Stuart Hall, along with millions of other individuals. Readings from William Blake, Charles Dickens, Virginia Woolf, Mervyn Peake and others, lectures and personal reminiscences by Stuart Hall, and music, particularly jazz of the era, along with sounds of all kinds are woven together to add much of the emotional resonance of the artwork. 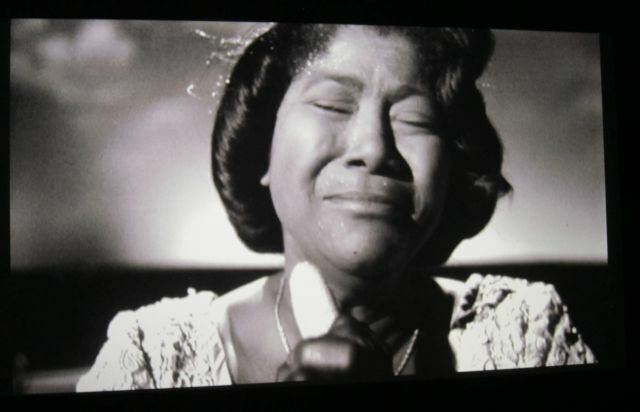 The audio reaches a kind of crescendo at the point where Mahalia Jackson sings an extraordinary version of Silent Night, tears streaming down her face, within a melange of images including an actual birth. Below is an (incomplete) list of countries and the dates they achieved independence from the United Kingdom.